Anyone that’s been to one of my classes or has had some 121 training with me will know of my love of talking about dog body language!! It’s a real passion of mine to help guardians understand how their dog is trying to communicate to them and others around them (including other animals) to help avoid aggression borne of stress, anxiety or fear escalating. Using body language, body signals and noise are the only method our dogs have of telling us how they feel in certain situations so it’s imperative we listen and don’t tell them off or shut them down. If these signals are ignored and the dog isn’t removed from the situation then they could start to display more obvious signals which us humans often associate with fear. Ears creep back, you see the whites of the dogs eyes (whale eye), they have a crouched body position, sometimes the tail is tucked under. If you start to see this behaviour step in and support your dog by removing them and comforting them. If these signals are ignored then you could end up in the danger zone of growling, snapping and worst case biting. This is your dog shouting at you so LISTEN!! NEVER tell a dog off for growling! Radical isn’t it?! Growling is a warning from your dog to please back off and give me space or stop doing whatever you’re doing. If they get told off or ignored then next time they could miss out the growl and go for the bite as the growl didn’t work for them. Again please remember context is imperative. Growling can sometimes be play related and that’s fine. You need to judge the situation and look at the whole dogs body language together to make a judgement. Be your dogs advocate, if they aren’t happy in a situation take responsibility to remove them and give them choice. 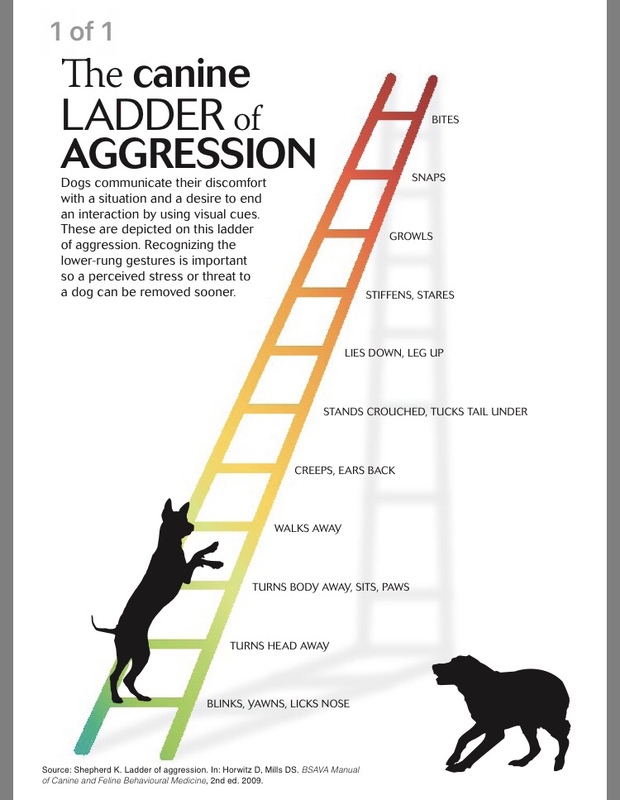 I love the Canine Ladder of Aggression which I’ve attached to this blog. It’s a great visual aid which I give to my clients.